Grasp the top portion of the windshield washer container filler tube and rotate the tube 1/8 turn counterclockwise to unlock from the windshield washer solvent container lock tabs. Pull the tube straight from the windshield washer solvent container. 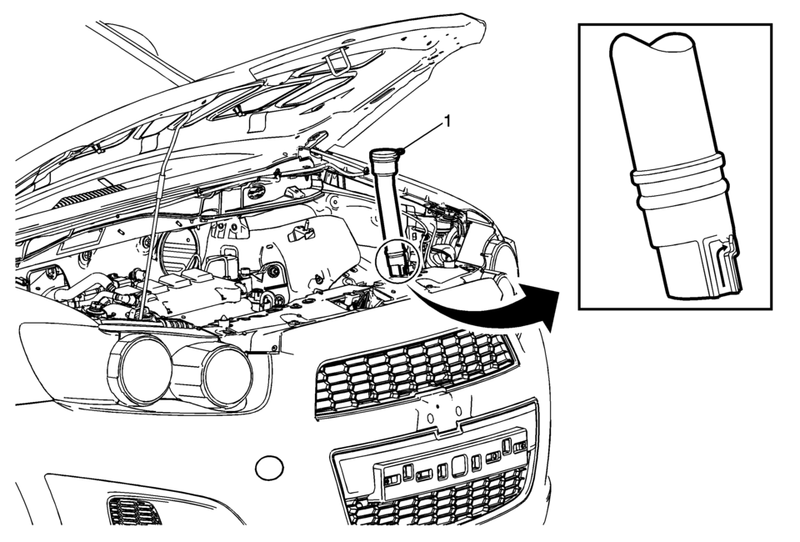 Inspect and/or replace the seal on the windshield washer container filler tube if damaged. Inspect the seal on the filler tube, replace as needed. Remove and transfer the windshield washer solvent container cap. Upon installation of the windshield washer solvent container filler tube back into the windshield washer solvent container, ensure to twist the filler tube 1/8 turn clockwise and lock the filler tube into the container lock tabs.